Let’s see. Democrats who control both the House and the Senate vote to give themselves pay increases, while voting to INCREASE the cost of our health care while voting NOT give Americans COLA (cost of living allowances). Two years of Obama; two years of no cost of living increases. Meanwhile, Democrats want to seize my 401k savings and “redistribute” it to bankrupted union pension plans. Those union workers have received far better pensions than I ever have. But they fund the corrupt Democrat machine with campaign money they themselves seize from their workers, so you can bet the Democrat Party is going to keep giving them one kickback after another. But I love getting screwed by my government. So I’m voting for the party of screwing one group of people to give handouts to themselves and to their supporters. I’m voting Democrat. Will they have your cost of drugs – doctor fees – local taxes – food, etc., decrease? You obviously are too stupid or don’t care. Make sure you’re still mad in November 2010 and remind their replacements not to screw-up. It is ok to forward this to your sphere of influence if you are finally tired of the abuse. Maybe it’s time for Amendment 28 to the Constitution..
Let’s get this passed around, folks – these people in Washington have brought this upon themselves! It’s time for retribution. Let’s take back America ..
You’ve got one chance to correct a terrible mistake. Vote for conservatives on Tuesday, or get another two years of terrible policies and demagogic excuses. Obama and Democrats lied in the most cynical and corrupt way. They assured America that they could cover some 30 million more people and yet make health care cheaper. Key components of ObamaCare are going into effect. And yes, Average Joe American, YOU are going to pay for Obama’s compassion (because HE certainly won’t!). Insurance companies are now being forced to accept children regardless of prior-existing conditions, raising their costs dramatically. And “children” up to 26 years of age must now be accepted under parents’ plans. As health insurers are forced to accept more and more risks that will hit their bottom lines, they are passing those costs on to everyone. As anybody but a fool should have readily understood. And you’d do the same thing if you were a business owner with a functioning brain cell in your skull. Watch your premiums begin to skyrocket. Watch employers dump your plans. Watch Obama’s and the Democrat Party’s lies become increasingly awful. Recently, Fox News anchor Bill O’Reilly also received a similar notice from his health care provider, (Anthem Blue Cross), and was told that his annual premium will increase by $2,100. The excuse given was the same boilerplate as set forth above. 3. His Medicare Part B deductible is being increased from $135 to $155. American health care providers are gouging consumers in advance of Obamacare taking effect in 2014. According to publicly available profit and loss statements, our nation’s largest health care providers such as Humana, Wellpoint, United Health Group, Cigna and Aetna collectively posted a net income of over 12 billion dollars in 2009. Is it not just a little bit suspicious and beyond coincidence that so many Americans are receiving these letters from separate “independent” health care providers all over the country? The letters are almost identical in content and verbiage. According to the Consumers Union report, not-for-profit Blue Cross/Blue Shield groups are raising health insurance premiums by as much as double digits to build up their cash reserves — in some instances to more than three times what states require. It is no secret that these companies generate substantial investment income from reserves. – Blue Cross Blue Shield of Arizona raised its reserves from $648 million in 2007 to $717 million in 2009 (more than seven times the amount required in that state). During that time, individual policy rates jumped about 40 percent. – Health Care Services Corp., which includes Blues plans in Texas, Illinois, New Mexico and Oklahoma, built up its surplus from $6.1 billion in 2007 to $6.7 billion in 2009, five times the minimum in those states. Meanwhile, its plans’ rates rose by up to 20 percent a year. So which is it? Are the companies raising rates to build reserves or are they raising rates in advance of rising costs they are anticipating by Obamacare, or are they raising rates because of an actual rise in the delivery of actual medical costs? You cannot get a straight answer. If, in fact, health care providers are sitting on piles on cash that is far in excess of what it should be under state laws, why are they not rebating those surpluses to policyholders, as many automobile insurance companies do? Another example of how Obamacare has influenced the behavior of health care providers is that under the new federal law it mandates that no more that 20 percent of every premium dollar be attributable to administrative costs. Therefore many companies who currently run 26 percent of administrative costs for every dollar have now “reclassified” many administrative services as “medical” so they do not lose income and can avoid reducing overhead. The bottom line is that in advance of Obamacare the consumer is getting taken advantage of with any recourse. Looming over their heads is a law that does not even take effect until 2014. In the meantime We the People are stuck between greedy insurance companies and incompetent government. and 5. Facilitate the import on FDA approved drugs. At a time of deep recession, high unemployment, record home foreclosures and personal and business bankruptcies, the last thing we need is further economic uncertainty looming with regard to nationalized health care. America, let’s not accept commercial gouging or government incompetence and bureaucracy. Let’s fix what needs fixing! Every single one of these companies are raising their rates dramatically at the same time as incredibly costly ObamaCare provisions begin to take effect. It isn’t a coincidence. And because of such expensive provisions, some insurers are no longer offering policies covering children. ObamaCare is a catastrophe. It is “the sum of all fears.” And, as Bradley Blakeman points out, it couldn’t have attacked the economy at a worse time. 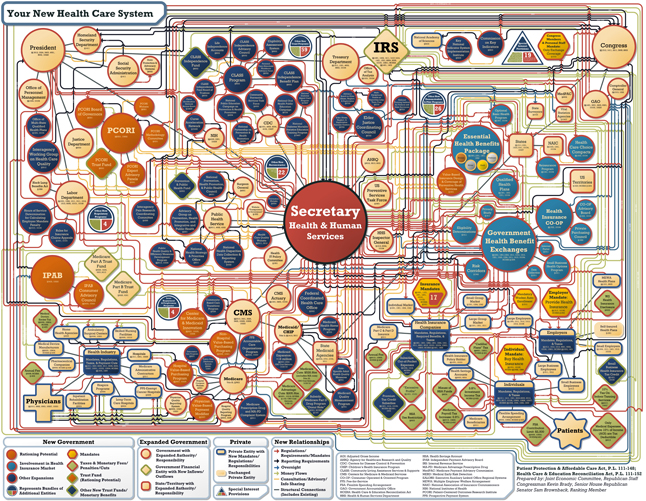 ObamaCare was NEVER about health care; it was ALWAYS about imposing more control over the people. Those who didn’t vote for Obama and Democrats ought to be able to take their premiums to their Democrat neighbors and force them to pay for the massive increases that they voted for. It is long past time that Democrats should be allowed to get away with voting to be generous with other peoples’ money. 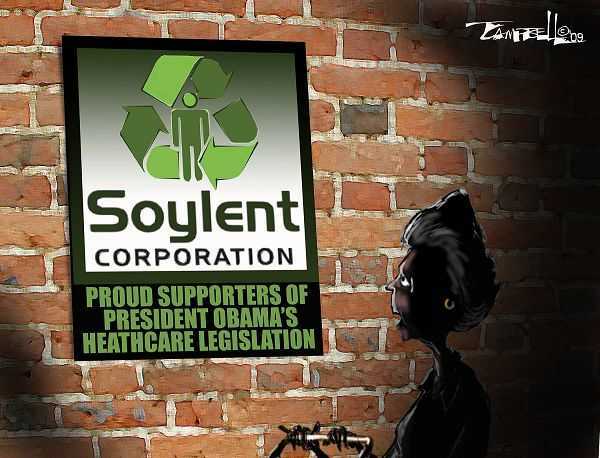 When Soylent Green time comes, eat all the Democrats first. The Obama administration is asking why Anthem Blue Cross is raising its health insurance rates by nearly 40 percent for some California customers while making handsome profits — and is pointing to the rate hike as evidence of why health care reform needs to pass. Okay. Barry Hussein got his ObamaCare passed. So if there are any other rate increases from any other insurance companies, who should we blame now? Blame Obama and blame the Democrats. They wanted health care. Now it’s all theirs. Democrats demonized and demagogued their way to owning health care. Well, now they own it. So let the demonization and demagoguery fall entirely upon their heads from this day forward. If your rates go up by as much as one penny, or if your benefits are reduced in any way, shape, or form from now on, you have one scapegoat: Democrats. Make sure they wear it around their necks. Cry out loud. Scream about it. Call the news. Blog about it. You opened your mail, and Barack Obama made your premiums go up. Make sure everybody hears that Obama promised to fix your health care, and now it’s more expensive. An unending crescendo of constant blame on ObamaCare and rising costs from any health care insurance provider from anywhere in the country would be music to my ears. The era of blame Bush is over. The era of blame Obama begins today.